Which paper shredders are best for home office use in 2017? We’ve now surveyed 2,020 consumer experts – UK owners who’ve invested in a shredder for domestic or home office use. These people have used their confidential paper destroyers for six weeks or more. What owners told us forms the basis of what we publish here at Best Buys Compared. Most paper shredders (whether strip cut, cross-cut or diamond cut) consist of a slot or neck set above a rotating cutting head. These machines are the quickest, most convenient way to securely dispose of unwanted confidential or financial paper work and protect against identity theft and fraud. 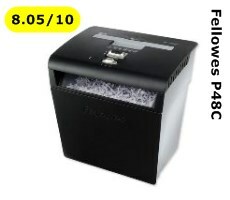 A paper shredder for home use starts as soon as it senses paper in its neck. The shredding action pulls the unwanted sheet or sheets through the machine. Paper is rendered down into tiny oblongs a few millimetres in length. There’s also a reverse button in case of jams. The shredder unit usually sits above a basket to catch the paper particles. Instead of a waste basket, some shredders have pull out draw/bins which may be less messy. 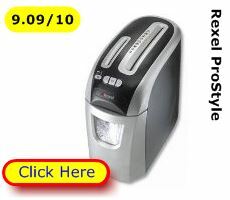 You can compare paper shredders for home offices easily here. 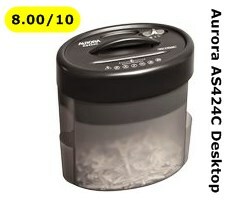 Our comparison table lists the features of the best desk-side or desk-top shredders at-a-glance. Now you can quickly choose the right model for your needs. The best cross-cut shredders for home service (according to owners) come from Aurora, Draper, Fellowes, Rexel, Ryman & Swordfish. A wide paper slot means that you are more likely to quickly get your paper square onto the cutter. That means you’ll avoid creasing which slows the shredding and miss-feeds which might jam the works and require use of the reverse button. 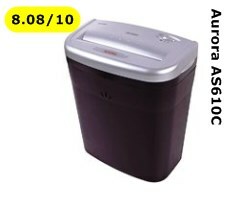 Most home shredders have a continuous use endurance of c2 minutes. That’s usually enough to dispose of, maybe, 10-15 single sheets of A4 paper, fed one after another. You’ll pay more for a longer endurance. 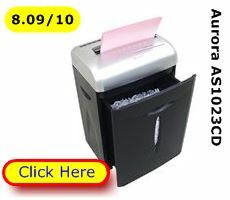 4 pages of 80gsm A4 paper can normally pass through a shredder in one go. The security DIN rating refers to the final size of paper fragments. A DIN 3 or 4 machine will render a fine chaff of paper that’s impossible to read. A 12L waste bin can hold the minced shreds from around 120 sheets of A4 paper. Emptying a paper shredder can be a messy business. A pull-out waste bin is preferable to a lift off cutter head. 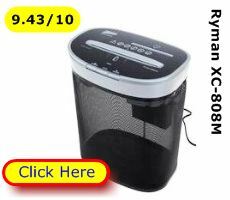 You’ll also have potentially less mess if your shredder basket will take “shredder sacks” without impeding the cutter head. Look for a reverse button (one way to clear jams). And use shredder oil and/or oiled lubrication sheets from time to time. This keeps the cutters lubricated and keen. It also helps avoid jams. You don’t want to be de-stapling when you could be shredding. However many staples or worse, paper clips, will dull the paper cutters. These options are nice to have. 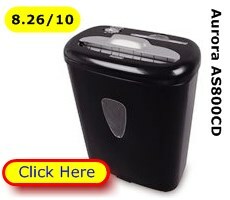 Separate slots either shred or scratch data DVDs and chew up unwanted credit cards. If you’re the impatient type you’ll probably enjoy clearing paper jams. A fraction of a second spent lining up your paper, square, in the shredder’s mouth will result in satisfaction not frustration. A shredder makes noise. It’s not ear splitting but not something to do in the dead of night. Are you a hoarder of unwanted paper work? 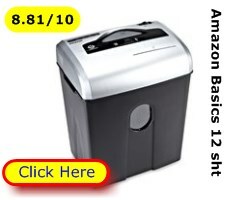 With domestic paper shredders the practical rule is little and often. If you store up great wadges of paper for disposal you’ll be frustrated when the thermal cut-out clicks in after 2 or 3 minutes. You’ll also be tempted to shred multiple sheets. This increases the chances of paper jams and makes the cutter work harder, causing the thermal cut-out to click in quicker. Some paper disposal units come with a natty metal mesh waste bin. You can see how many shreds are in the bin. But Din 3 or 4 shredding also generates paper dust which floats through the mesh. You know what confetti looks like on the ground? No matter how careful you are you’ll generate some dust and paper chaff on the floor when you empty the bin. The worst culprits are the shredders with a lift-off cutting head. Rank Model Overall Users' Satisfaction Rating* Home use Personal office use Sheets shred in 1 pass Bin capacity A4 sheets Shreds CDs Shreds credit cards Lift off or pull out Best Buy? Could you pay too much - even for quality? 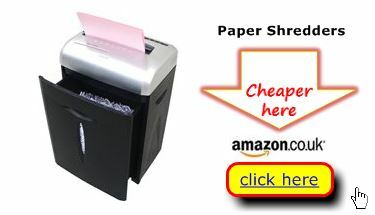 We say don’t buy that cheap paper shredder when you can buy the best shredder for your home office almost as cheaply. How does 50% off sound? You can pick up a reasonable paper destroyer for around £35. 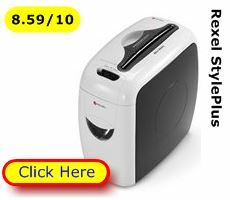 Best Buys Compared is the easy way to make your money go further and acquire the means to quickly and simply shred away confidential papers and statements, with a minimum of mess.